Developer Insights: Creating A Most Monstrous Hallow’s End! Hallow’s End returns for a second year in Hearthstone, but it’s not quite the same celebration it was before. What’s new? Our Live Content team has a special peek behind the scenes just for you! The Headless Horseman Rides… Again! Hallow’s End returns for an encore in Hearthstone this year, and we’re pleased to report that the Horseman has got a few more tricks (treats, really!) up his sleeve! 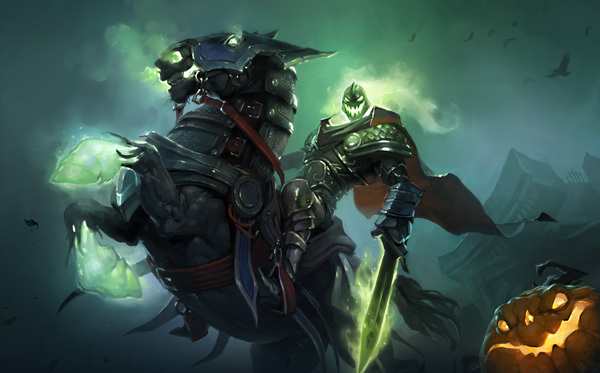 Making a return are a few crowd favorites, like The Headless Horseman Rides brawl, themed costumes and emotes, and Dual-Class Arena—all of which we’re really excited for. In addition, there’s a brand-new brawl and an exciting reward coming with this holiday event! But first, let’s get into the spirit of the season. 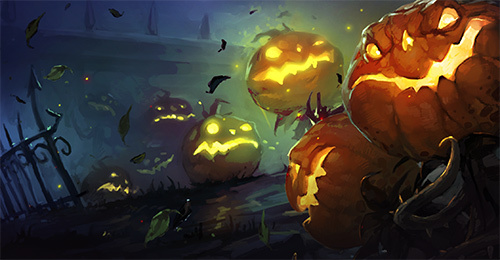 Why is the team so excited about Hallow’s End anyway? One Dark, Spooky Night. . . .
One of our team members, Pat Nagle, used to run haunted houses with a friend back in high school. He did it every year, consistently, for over a decade, and each year it got bigger and scarier. Toward the end of his haunted house’s reign, there would be a line around the block for entry—they even had to stretch it across two days so everyone could get their share of scares. We’re excited to have welcomed that spirit into Hearthstone! Hallow’s End isn’t just about the scares—the team loves the idea of dressing up and becoming someone else, just for one night. That desire to become a storied character is what inspired the new brawl, Monster Smash. Earlier this year, we released The Witchwood, an expansion that shared a lot of the same spirit as Hallow’s End. It was rife with characters that really fit those classic Halloween tropes, and we really liked the idea of being able to dress up as them. That’s what you get to do in Monster Smash. 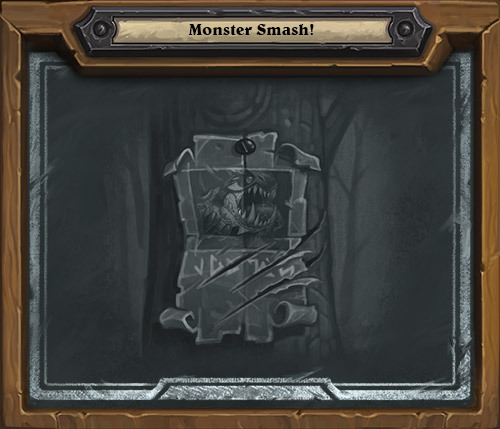 This brawl will let you take control of one of the Monster Hunt bosses from The Witchwood. But which of the bosses is the most powerful? At the end of the week, we’ll be able to see which boss from Monster Hunt won the most matches! If this Brawl is well received, we may look at doing one like this for Kobolds & Catacombs’ Dungeon Run in the future! We took most of the Monster Smash bosses directly from Monster Hunt, but a few of them needed little tweaks to make sure they could show up to Hallow’s End in style. We had a lot of fun during playtesting as we experienced the varying power levels of bosses. Azalina Soulthief was very strong, and a personal favorite of ours. The legendary Chupacabran, on the other hand, needed a little buff, so we gave him some extra juice. Make sure to try the Monster Smash Brawl to see all of the Monster Hunt bosses in action! Just like Pat’s long-running haunted house, we hope to keep giving you a new experience every time a seasonal event like Hallow’s End comes around. The tools at our disposal improve each year, allowing us to continue doing exciting stuff—like giving everyone a Golden Witch’s Cauldron upon login when this year’s spook-tacular celebration begins! We hope you enjoy Hallow’s End—the eeriest of holidays in Azeroth! Let us know what you think of the event over social media or in the comments below. For the curious, the Hallow! Hallow! Bundle will add 20 The Witchwood card packs and the new Paladin hero, Sir Annoy-O, to your collection.